Started out her career on radio shows (Blondie, This Is Your FBI) ; Had her own Radio Show (The Betty White Show) ; Starred in and Produced the TV Show "Life With Elizabeth" ; Won Emmy for Life With Elizabeth ; Appeared on Game Shows 'Match Game', 'What's My Line? ', 'The Tonight Show', and 'Password' ; Married Password host Allan Ludden ; Guest Starred on 'The Mary Tyler Moore Show' as Sue Ann Nivens (the homemaker) ; Guest Appeared on 'The Love Boat', 'Mama's Family'; Starred in 'The Golden Girls' as Rose Nylund ; Starred in 'The Golden Palace' as Rose Nylund ; Won Emmy (for her role as Rose on TGG) for Best Actress in a Comedy Series (1987) ; Appeared in the movie 'Lake Placid'. 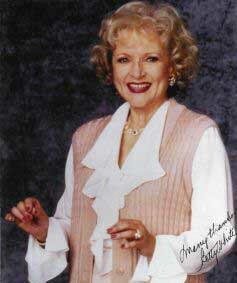 More Betty White pictures to come soon!